The development of Cal’s defense went overlooked because of the flashy ratings of the recruiting class. Martin got that group to defend above all else. Peak Cal was defending. Rock bottom Cal was the week of the NCAA’s first round with sexual assault allegations against their top recruiter and a broken hand for Ty Wallace. Naturally they lost that next game to Hawaii. Oh, and then we spent the immediate off-season wondering if Cuonzo even had a contract (he does now!). OK sure, Winn and Hanner played out the scenario if Rabb had left for the League. In that scenario, the Bears fall fifty-two (52) spots from 17th to 69th [insert Gronk giggle]. The team must be greater than this single part. No matter what the math and our eyeballs tell us. And consider that perhaps they can play defense without Wallace and Brown (Law firm?). The Bears did a fantastic job of forcing bad, long, jumpers. For the year, 38.8% percent of shots taken against Cal were neither threes (lotta points!) or layups/dunks (easy!). That 38.8% mark was 13th best in the nation. On the whole, teams had the 2nd worst 2FG% (nationally) against the Bears. Did the length of Brown and Wallace help? Absolutely. But just as Arizona did a better job forcing jumpers than Cal (6th nationally) the Wildcats are going to miss the paint protection provided by Kaleb Tarczewski. Cal doesn’t lose their paint protecting bigs. Returning is Rabb (obvs) as well as 7-foot juniors Kingsley Okoroh and Kameron Rooks. The latter of which we can’t sleep on offensively. Rooks put up an Ortg of 119.4 (on par with Rabb) with just a 12.1% usage. This sort of high efficiency, low utilization often translates to future success. And the touches will be there. Wallace and Brown led the conference in usage (and were nowhere near the leaders in efficiency) suggesting the sum of the parts not missing shots could be more offensively effective. Percentage of offense against the Bears taken in transition last season. That was the 7th lowest percentage in the country and when you consider the average eFG% of transition buckets is about 55% vs. 49% in non-transition scenarios, that bodes well for Cal. The cynic (most closely aligned with my views): Rabb is really good. But I ask: Can he do what Jakob Poeltl did last season? That’s a great case for a sophomore big carrying a team and Rabb could do it. But I liked the pieces around Poeltl a lot better than I do Bird and the Grant Mullins (Columbia transfer)/Sam Singer (28% career 3FG%) combo. That’s two possession guards, mild threats to what Rabb creates inside. The loss of Jordan McLaughlin is huge. Furthermore, how does a team that truly buttered its bread with defense replace two 6’7” perimeter monsters? The optimist (most closely aligned with others): Ivan Rabb received the second most AP All American votes in the country. He’s really damn good. Whether Matthews is a shooting threat (he will be in Spokane) or not is irrelevant. The Bears have one of the most dominant forces in the country and will put to herculean use the 121 offensive efficiency that was put to just 20.6% usage last season. Mullins shot 44% from deep last year while Bird connected on 41% (37% for his career). The perimeter is covered and Cal’s defensive prowess was really on the interior. The Bears return their entire front court and Sam Singer has got to play confidently at some point, right? Johnny Dawkins once answered my question about what his nearly intact (returning) 18-win team was going to do differently. He told me they’d think differently about things and then won….19 games. Well Stanford is thinking differently about winning 19 games annually and they went to Jerod. Jerod Haase that is. The Cardinal put up nominal and unexciting numbers. They finished 15-15, 8-10 in conference. In his eight years at Stanford the Cardinal made one NCAA tournament (consequently one Sweet Sixteen) and won two NIT titles. Johnny Dawkins never got a win against Sean Miller. He won 156 games, good for a 57% win percentage. He lost 46% of his Pac-12 contests and never finished better than tied for 3rd (in which they were still the 6-seed). Is that not the weirdest resume? Also, don’t be the guy that forgets the roster Haase inherits. Missing from last season’s effort was starting PG Robert Cartwright and PF Reid Travis Reid (if you say it twice you can’t get the double first name wrong). Furthermore, Dorian Pickens is poised for a breakout year and Michael Humphrey isn’t a slouch in the middle. And did you see the OJ documentary? Marcus Allen is a threat. Too far? And be optimistic. Even I was at the end of not being that guy. I’m not sure what brings Stanford fans out. I know when things are going well they create an atmosphere as raucous as anyone. They’ve been banned from the Orange Bowl (“What’s a bowl?” said the Arizona fan). Haase’s ink to paper wasn’t necessarily going to pack Maples. But Jerod Haase has the opportunity to win there and it could be really fun. 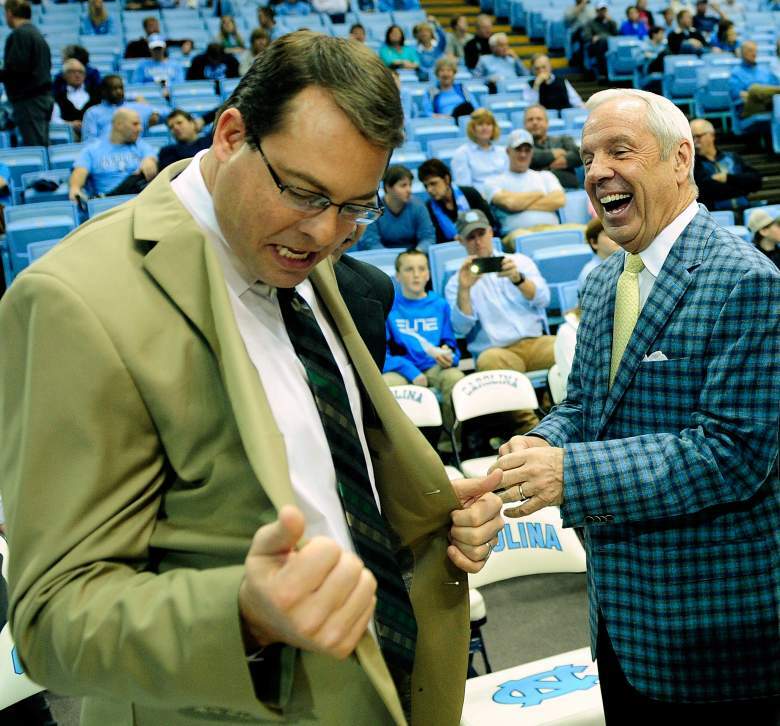 Consider that Haase became a head coach under the tutelage (as both player and coach) of Roy Williams. Whatever you think about Roy Williams, his teams are fun to watch (if you disagree, say something). While at UAB, Haase’s teams didn’t necessarily run-and-secondary-break like crazy (68.5 was his average tempo, about the national average). But most coaches don’t get to coach to their true colors until they get players. At Stanford, Haase will get players. Adjusted tempo of the 2013 UAB Blazers, Jerod Haase’s first year there. Why do I note this? Because I want him to achieve greater than this with these Cardinal. Under Dawkins they snailed around 66.8 possessions. Snooze. They didn’t even defend well at that pace (92nd nationally). Jerod! Let your inner Roy shine!!! By shear volume of words written about the Cardinal I think you can deduce that I like this team. I want to like Jerod Haase. I’m excited. I’m going to a Stanford-Colorado State game on 11/20 and I want to party with Larry Eustachy. And if that’s wrong then I don’t want to be right. Ultimately these Cardinal won’t be that good but I think they’ll actually exceed last season’s 15-15 (8-10) mark. Welcome, Jerod!